Ikebana Vases - buy online! 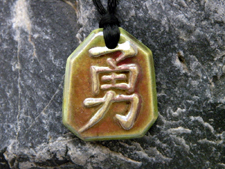 Kanji Charms - buy online! 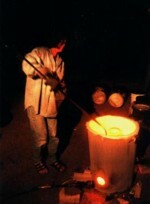 RAKU is a firing technique that was developed in 16th century Japan for the Japanese tea ceremony. This ancient technique of firing pots to a red-hot state, then cooling them quickly, is still used in RAKU firings today. While the pots are still glowing orange with molten glazes (1820° F or 1000°C), they are pulled out of the raku kiln with long tongs and placed in a cooling environment - in a metal bin filled with leaves, sawdust, or other combustible materials (reduction), in a bucket of water or in the open air (oxidation). “Reduction” refers to the act of depriving oxygen from metal oxides used in metallic glazes by creating flames that eat up the oxygen supply in the surrounding atmosphere. “Oxidation”, on the other hand, introduces oxygen into the metals. Flames dancing around pots that have been placed into a reduction atmosphere create natural patterns of copper, red, gold and orange colors unique to each individual pot, never to be repeated. “Oxidizing” the pot, subjecting the pot to water or air, will produce more blues and greens. White crackle glazes have no metal oxides (therefore white) and are designed to “crackle” with sudden changes in temperature. Contact with cooler materials, such as sawdust or air, causes the glaze to shrink more quickly than the pot and the crackles become more visible when smoke in the atmosphere impregnates the exposed clay body. Glazes will be shiny or matte depending on the glaze recipe. Unglazed areas will usually turn black from the smoky reduction atmosphere offering many possibilities for wax resist and masking designs. 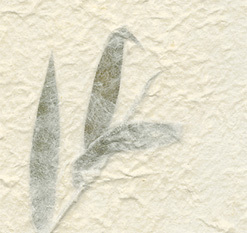 RAKU is a low-fire technique. 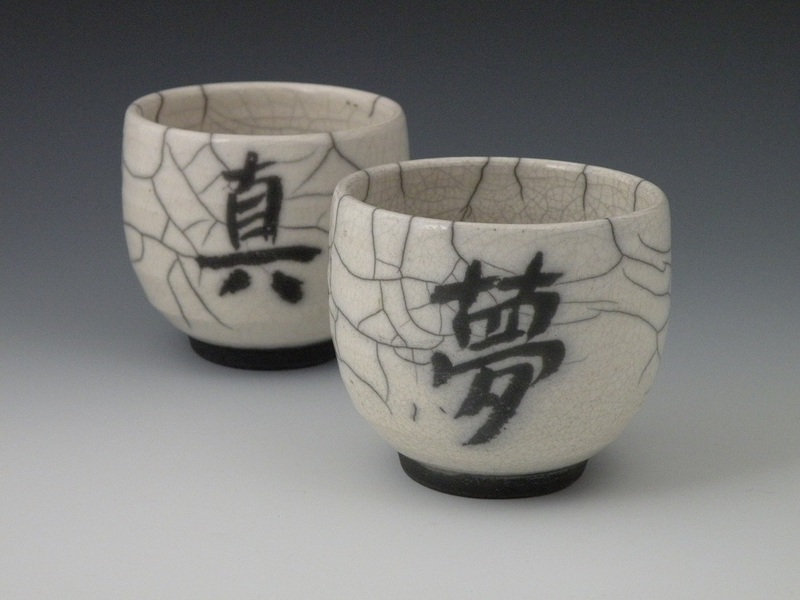 While my RAKU pottery uses glazes that are lead-free and safe for functional use, it is more porous and less watertight than stoneware and perhaps best appreciated as decorative ware. Foods containing acid or vinegar will change the copper colors. 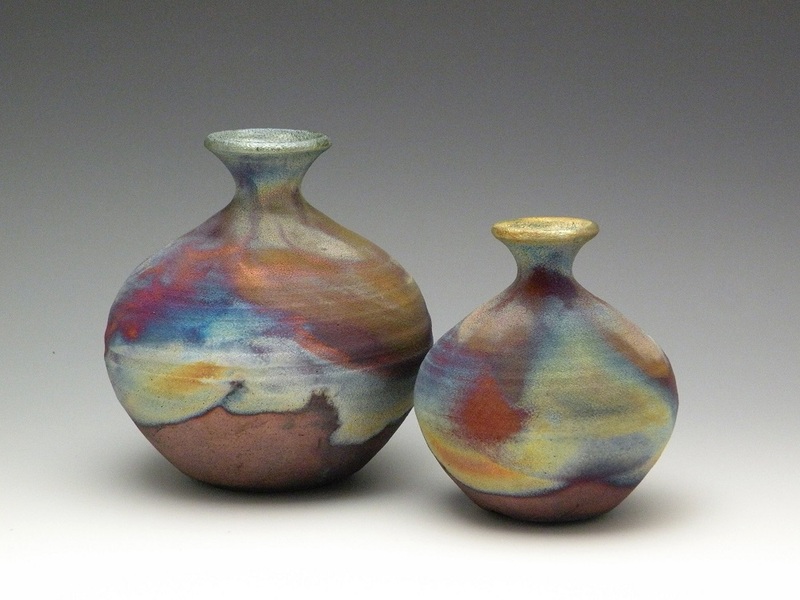 RAKU should be hand-washed delicately and kept away from extreme temperatures.